On our trip to Free Comic Book Day at Aquilonia Comics, derryX totally impulse bought an action figure. It was funny because I was able to see the thought going on in his mind on his face until he bought it, and then he calmed down a little. When we went back to derryX’s apartment, we were talking about action figures and stuff (I don’t know why I’m turning into the action figure guy, but I think it’s ok), and he showed me his wrestling figure collection, all of which are still sealed in the boxes (one day, I’ll take some pictures of his collection because I’m sure you guys would love that). So we talked about the plans for the Zombie Superman figure that he bought, and he said he was leaving it in the box. We had a little argument about it, and I argued that he should open it and use it as a new mascot for the site. Not that there’s anything wrong with Twitch from Toy Story 3, but the gray, black, and white nature of the Zombie Superman would be perfect to coincide with the direction that derryX has been explaining the site is going in the next few weeks. I know about some things that you’re going to have to wait to find out about. So I got him to agree to open it. He took a picture of it and uploaded it so that I can use it for this post. …and I’m taking full credit, because without my pressure, it would have stayed in a box forever. Can I be a nerd? Too bad, I’m going to anyway. 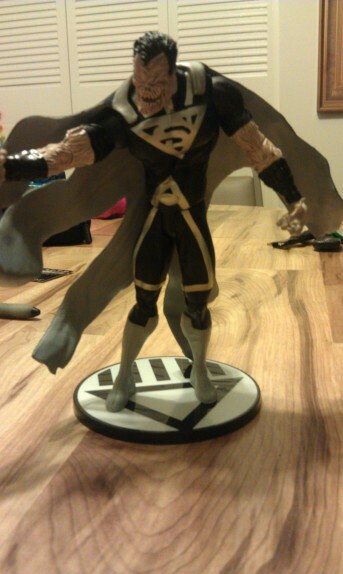 It’s actually Black Lantern Earth-2 Superman. I love it! all of it! By popular demand, Kevin Marshall’s comment and this comment by Wally Wackiman http://twitter.com/#!/WallyWackiman/statuses/73923050952863744 , I made an editorial change to dyscipleX’s post. If that’s what he’s called, that’s what he’s called. Since I didn’t read Black Lantern, I don’t know how a black lantern is different from a zombie. He looks like a zombie.